Can redistricting be opened to the public through open source and the web? On November 6, 2012, millions of citizens in the United States will elect or re-elect representatives in Congress. Long before those citizens reach the polls, however, their elected representatives and their political allies in the state legislatures will have selected their voters. Given powerful new data analysis tools, the practice of “gerrymandering, or creating partisan, incumbent-protected electoral districts through the manipulation of maps, has reached new heights in the 21st century. The drawing of these maps has been one of the least transparent processes in governance. Public participation has been limited or even blocked by the authorities in charge of redistricting. While gerrymandering has been part of American civic life since the birth of the republic, one of the best policy innovations of 2011 may offer hope for improving the redistricting process. DistrictBuilder, an open-source tool created by the Public Mapping Project, allows anyone to easily create legal districts. Michael P. McDonald, associate professor at George Mason University and director of the U.S. Elections Project, and Micah Altman, senior research scientist at Harvard University Institute for Quantitative Social Science, collaborated on the creation of DistrictBuilder with Azavea. For more on the potential and the challenges present here, watch the C-SPAN video of the Brookings Institution discussion on Congressional redistricting and gerrymandering, including what’s happening in states such as California and Maryland. Participants include Norm Ornstein of the American Enterprise Institute and David Wasserman of the Cook Political Report. DistrictBuilder lets users analyze if a given map complies with federal and advocacy-oriented standards. That means maps created with DistrictBuilder are legal and may be submitted to a given’s state’s authority. The software pulls data from several sources, including the 2010 US Census (race, age, population and ethnicity); election data; and map data, including how the current districts are drawn. Districts can also be divided by county lines, overall competitiveness between parties, and voting age. Each district must have the same total population number, though they are not required to have the same number of eligible voters. On the tech side, DistrictBuilder is a combination of Django, GeoServer, Celery, jQuery, PostgreSQL, and PostGIS. For more developer-related posts about DistrictBuilder, visit the Azavea website. A webinar that explains how to use DistrictBuilder is available here. DistrictBuilder is not the first attempt to make software that lets citizens try their hands at redistricting. ESRI launched a web-based application for Los Angeles this year. The New York Redistricting Project (NYRP) is hosting an open competition to redistrict New York congressional and state legislative districts. NYRP is collaborating with the Center for Electoral Politics and Democracy at Fordham University in an effort to see if college students can outclass Albany. The deadline for entering the New York student competition is Jan. 5, and the contest is open to all NY students. The 2010 elections put overwhelming Republican majorities in both houses of the Legislature just as the time came to draw new political maps for state legislators, the Congressional delegation and members of the State Board of Education. Those Republicans drew maps to give each district an even number of people and to maximize the number of Republican districts that could be created, they thought, under the Voting Rights Act and the federal and state constitutions. Or look at Illinois, where a Democratic redistricting plan would maximize the number of Democratic districts in that state. Or Pennsylvania, where a new map is drawing condemnation for being “rife with gerrymandering,” according to Eric Boehm of the PA Independent. That’s where MCIC has played a role. “MCIC has been working with the Midwest Democracy Network to implement DistrictBuilder for six states in the Midwest,” wrote Massa. According to Massa, Illinois, Indiana, Wisconsin, Michigan, and Ohio didn’t have anything available at a state level. Among these states, according to Massa, only Minnesota publishes clean data. Earlier this year, MCIC launched DistrictBuilder for Minnesota. 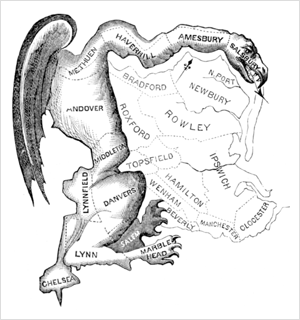 Image Credit: Elkanah Tisdale’s illustration of gerrymandering, via Wikipedia.